It’s January 5th and the motivation for maintaining a healthy lifestyle is in full swing. I think this month we’ll all be inspired and driven to stay true to our word but my concern is by next month the stress of the Christmas bills, busy schedules and the yucky weather may pull us into the direction of old habits and procrastination. I know from experience it doesn’t take much to get side tracked but I’ve also discovered that all my other goals such as financial goals, eating healthier, managing my time better or maintaining a healthy lifestyle are much easier to achieve when I have a FITNESS GOAL. Although, exercising 3x per week is a great choice it can be difficult to maintain. Because it isn’t a fitness goal, meaning it doesn’t have a finish line or target date, it becomes an endless, repetitive and possibly boring goal with no final outcome to CELEBRATE. It’s hard to STAY MOTIVATED when there is no CELEBRATION at the end! What eventually seems to happen is other things take priority and exercise continues to get bumped off the schedule until it’s no longer a part of your routine. I encourage you to commit to a FITNESS GOAL that is part of an organized event. Why? You will have a tangible date to work towards. You will be part of the incredible ENERGY surrounding the event. You will feel the ACCOMPLISHMENT of crossing the finish line. It’s amazing! You will feel sheer JOY knowing you followed through on a commitment. It’s an exceptional way to build SELF ESTEEM, deal with stress, anxiety and manage DEPRESSION. You can work on your goal with others and receive support. It’s FUN! All other goals (such as losing weight, eating healthier, getting more sleep, living with less stress etc) naturally become easier because of your fitness goal. You may hate jogging. I used to hate running too but I’m not asking you to jog. I’m asking you to find an organized event that you can set as your target date. You can walk, jog, hike, cycle or row in that event. If there are no events then create your own! That’s what I did for my 40th birthday and it was truly one of the best days of my life! AN IMPORTANT PART OF THE JOURNEY IS THE CELEBRATION AT THE END. YOU are worth the COMMITMENT. YOU are worth the CELEBRATION. Check out your local running, cycling or fitness store and see what events they have listed. Sign up! Be empowered! Have FUN! 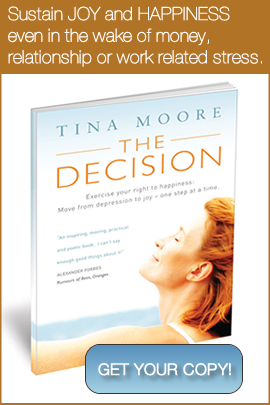 If you want a quick and easy read that will jump start your motivation and give you steps to complete your goals, check out my book THE DECISION. It’s simple, fast and a steal at $9.95! If you are looking for more incredible deals, LadySport has a great sale on right now for all your fitness needs. Check it out HERE. I hope you have a lovely weekend full of healthy delicious foods, warm hugs, fresh air and lots and lots of laughter! PS. 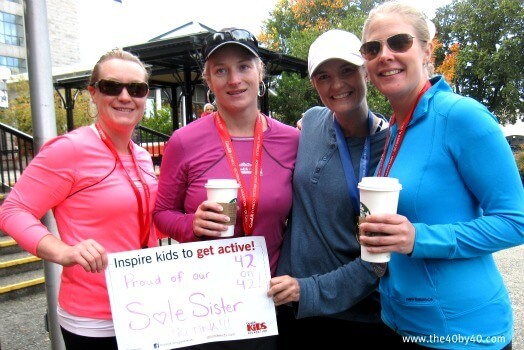 I have made a commitment to run four half marathons this year, what event are you signed up for? Let me know by commenting below, maybe we can do it together!